How to convert mod to AVI with MOD2AVI converter? How to convert word2PDF, with word2PDF converter ? How to convert image to icon with image to icon? How to convert PowerPoint/PPT to PDF files? How to convert DOCX to DOC with DOCX to DOC? Play MP4 /play MPEG4 with MP4 Player/MPEG4 Player? How to convert exe to msi? what is MSI? Convert PAL to NTSC with Blaze Media? When converting from NTSC to PAL, two things need to be accomplished. 480 lines of resolution have to be upconverted to 576 lines of resolution, and 30 images per second have to be downconverted to 25 images per second. The resolution upconversion does not actually add any real picture information to the image, as you cannot create real picture information where none existed before. It does, however, make the picture viewable on a PAL display, and often results in a superficially better-looking image. The frame rate conversion actually results in a loss of temporal resolution, as PAL has a lower frame rate than NTSC. Step1. First download theBlaze Media Pro here. Install it! Step2. After installion the program, open it, then you will open Blaze Media Pro. The main window is as follows. Step4. click the "Convert" button to begin the conversion process. 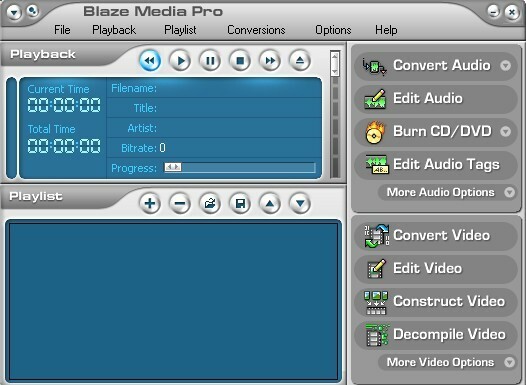 Advanced video converter options are available for those who want to take advantage of them, though they are completely optional, making Blaze Media Pro the perfect software to convert from NTSC to PAL or convert from PAL to NTSC for users of any experience level. Note: Using this software can also convert NTSC to PAL, the steps are same! Convert PAL to NTSC and convert NTSC to PAL with Movavi Video Converter. Step 1. download Movavi Video converter here , Install this utility. Step 2. Click add your PAL files and then Open. Step 3. select the output format. Step 4. select DVD NTSC Compatible in the next menu. If you have a NTSC file and want to convert NTSC to PAL, simply select DVD PAL Compatible in the Output Format menus. Other step is same. After click the convert button you will get a PAL files and then you can share your movies with your friends in Europe. Convert PAL to NTSC with PAL to NTSC DGPulldown? The converse situation applies to PAL to NTSC conversions. 576 lines of resolution are downconverted to 480 lines of resolution, and frames need to be inserted to go from the 25 frames per second of PAL to the 30 frames per second of NTSC. Once again, the resultant image is of less actual resolution than the original image, as information is discarded spatially and made up temporally. First download the DGPulldown here. Decompression it! Using DGPulldown is about as simple as it can get. Use the Browse buttons at the top to set the source and destination files. Select 25 --> 29.97 and click the Convert button. Wait a few minutes and you will have a video file that plays at 29.97fps. What is PAL and NTSC? NTSC is the video system or standard used in North America and most of South America. In NTSC, 30 frames are transmitted each second. Each frame is made up of 525 individual scan lines. PAL is the predominant video system or standard mostly used overseas. In PAL, 25 frames are transmitted each second. Each frame is made up of 625 individual scan lines. Comparing PAL and NTSC -To choose between NTSC and PAL, rate them on the comparison parameters. The total points are automatically shown in the top row. PAL can be decoded with two NTSC decoders. By switching between the two NTSC decoders every other line it is possible to decode PAL without a phase delay line or two phase-locked loop circuits. This works because one decoder receives a colour sub carrier with negated phase in relation to the other decoder. It then negates the phase of that sub carrier when decoding. This leads to smaller phase errors being cancelled out. However, a delay line PAL decoder gives superior performance. Some Japanese TVs originally used the dual NTSC method to avoid paying royalty to Telefunken. PAL supports SMPTE 498.3 while NTSC is compliant with EBU Recommendation 14. The issue of frame rates and colour sub carriers is ignored in this technical explanation. These technical details play no direct role to the decoding of the signal. Picture quality in PAL vs NTSC- PAL lines go out at 50 fields per second (since Europe uses a 50 hertz power supply) i.e. 25 alternating lines. PAL televisions produce 25 frames per second, that causes motion to be displayed faster. PAL may have fewer frames per second, but it also has more lines than NTSC. PAL television broadcasts have 625 lines of resolution, compared to NTSC's 525. More lines means more visual information, which equals better picture quality and resolution. How to convert between NTFS to FAT32? NTFS vs FAT32? How to Recover Encrypted file on NTFS Drive? How to format hard disk partitions with FAT/FAT32 or NTFS? How to convert hard disk files between FAT/FAT32 and NTFS format? How to Recover Compressed files on NTFS Drive?